International institutions, national governments and communities are promoting and measuring happiness in various ways. However, as of the writing of this article, there is not an agreed upon happiness index that institutions, governments, and communities use to gather and compare data. On the other hand, the Sustainable Development Goals (SDGs), which have a set of indicators commonly shared by institutions, governments, and communities, do not explicitly consider happiness even though SDG Goal 3: Good Health and Well-being references well-being. In this article, we construct an Aggregated Happiness Index (AHI) based on five indices in use and applied at different governance levels. Based on common domains and indicators from these indices, the AHI is composed of twelve domains, thirty-one indicators and distinguishes between objective and subjective indicators. 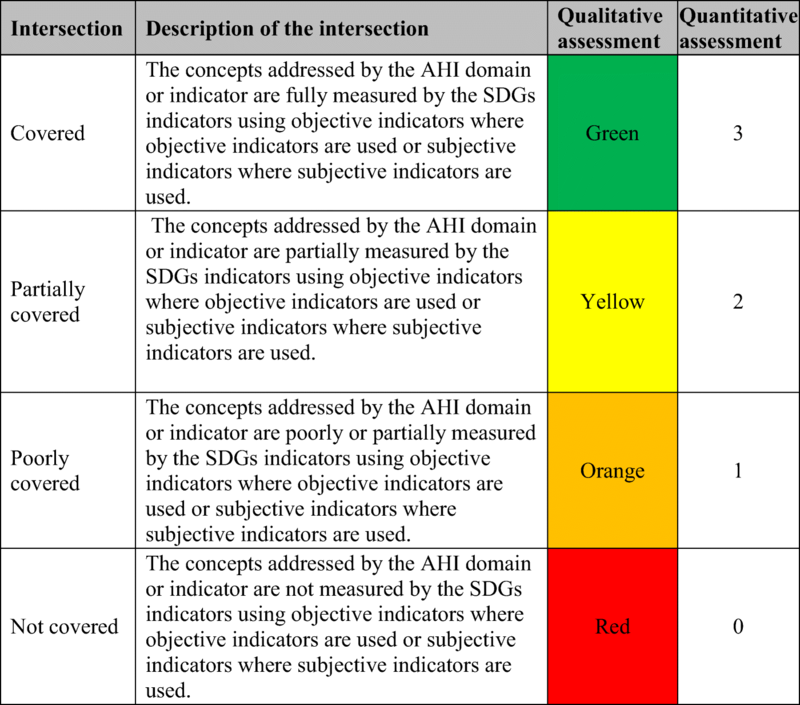 The AHI domains and indicators are benchmarked against the SDGs goals and indicators respectively using a grading schema based on a traffic light. Our analysis reveals that at the domain level the SDGs cover 66.7% of the AHI, however the coverage at indicator level drops to 48.6%. The SDGs indicators cover 61.1% of the AHI objective indicators and 17.9% of the AHI subjective indicators. Major gaps are found in the domains of community & social support, subjective well-being and time balance. We found a lack of subjective metrics in other domains, including economic standard of living and health. We discuss the opportunities and drawbacks of approaching SDGs and happiness metrics separately or synergistically. Given the potential benefits of integrating both approaches, we propose the framework we term SDGs for Happiness composed of 18 indicators of which 61.1% are subjective that should be considered in addition to the SDG indicators to measure happiness within the SDGs. Shortly after the turn of the millennium, a call emerged from nations and international institutions to use wider measures of well-being, also called happiness, quality-of-life or Beyond GDP indicators in lieu or in addition to gross domestic product (Stiglitz et al. 2009). Some of these initiatives are the call from the United Nations (UN) General Assembly ( 2011) on member states to adopt happiness and well-being in terms of measurements and goals (p. 9); the issue of the World Happiness Report since 2012 (see World Happiness Report); the Global Happiness Policy Report first published in 2018 (Global Happiness Council 2018); and the Better Life Index developed by the Organisation for Economic Co-operation and Development (OECD) issued in 2011. Countries are using indicators of happiness and well-being, including subjective well-being (SWB) indicators, to gather data (Durand et al. 2018; Musikanski and Polley 2016; O’Donnell et al. 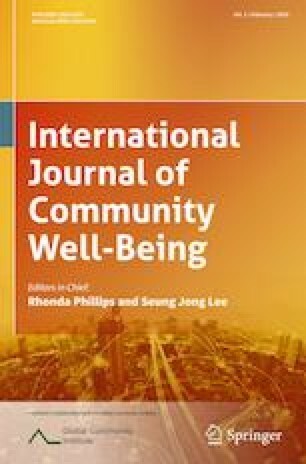 2014), and communities across the globe are measuring happiness and using the data to guide interventions (Musikanski et al. 2017). Bhutan and the United Arab Emirates are forming policy specifically aimed at increasing the happiness of their populations (Centre for Bhutan Studies and GNH 2018; Musikanski 2014; Musikanski 2018). Life evaluation: a reflective assessment of life satisfaction and the circumstances of life. Affect: a person’s feelings or emotion states, typically measured with reference to a particular point in time. Eudaimonia: a sense of meaning and purpose in life, also called flourishing. In 2015, the UN released the SDGs for use as a blueprint to promote sustainable development globally. The UN SDGs are composed of 17 goals, 169 targets and 232 indicators (United Nations Statistics Division 2017). Together, the goals, targets, and indicators make up the SDG framework, also called Agenda 2030. The SDG framework has been adopted by all UN Member Nations, and, as recognized in paragraph 55 of the United Nations General Assembly (2015) Resolution Transforming Our World: the 2030 Agenda for Sustainable Development, targets are defined as aspirational and global, with each government setting its own national targets guided by the global goals and taking into account national circumstances. The SDGs include a goal that uses the term well-being, for SDG Goal 3: Good Health and Well-being but there are not specific indicators to address SWB. Moreover, the SDGs by and large do not include subjective indicators. We build an Aggregated Happiness Index (AHI) considering various happiness indices already in use. We benchmark the AHI domains and indicators with the SDGs goals and indicators to understand the overlaps and the gaps. We discuss the opportunities and drawbacks of using the SDG framework and happiness framework separately or synergistically and we suggest how SDG indicators and happiness metrics can be used in conjunction. World Happiness Report (WHR) for 2018. (Helliwell et al. 2018, pp. 16–17). OECD’s How’s Life? 2017 (OECD-HLR) (Organization for Economic Cooperation and Development, 2017b, pp. 200–202). European Union’s Eurostat Quality-of-Life Indicators (EU-QLI) (European Union Eurostat n.d.). Bhutan’s Gross National Happiness Index (B-GNH) (Ura et al. 2012, p. 42; Centre for Bhutan Studies and GNH Research 2016, p. 57). United Kingdom’s Office of National Statistics Measurements of National Well-being (UK-MNWB) (United Kingdom Office for National Statistics 2018). For the purposes of this article, domains are general categories into which indicators fit. Other terms used for domains in the literature are dimensions, circumstances of life, aspects, and areas. The term indicator is used to describe a single measurement for the purposes of this article. Other terms for indicator are metric, measurement, and measure. We used the term index to describe an aggregate or composite measurement which is composed of domains and respective indicators. In forming the AHI, the indicators within each happiness index were determined to be either objective or subjective. Indicators measuring observable phenomena, such as charitable donations or frequency of volunteering, were classified as objective while indicators measuring opinions, feelings, or other phenomena that cannot be observed, such as satisfaction with one’s life or other dimensions of life, were classified as subjective. In forming the AHI, domains were identified based on the frequency of use by the indices and the broadness of the term. For example, the domain called Where we live for the UK-MNWB index was classified into the broader appellation of housing conditions. When a domain for a happiness index overlapped more than one AHI domains, the domain for the happiness index was used for both categories. 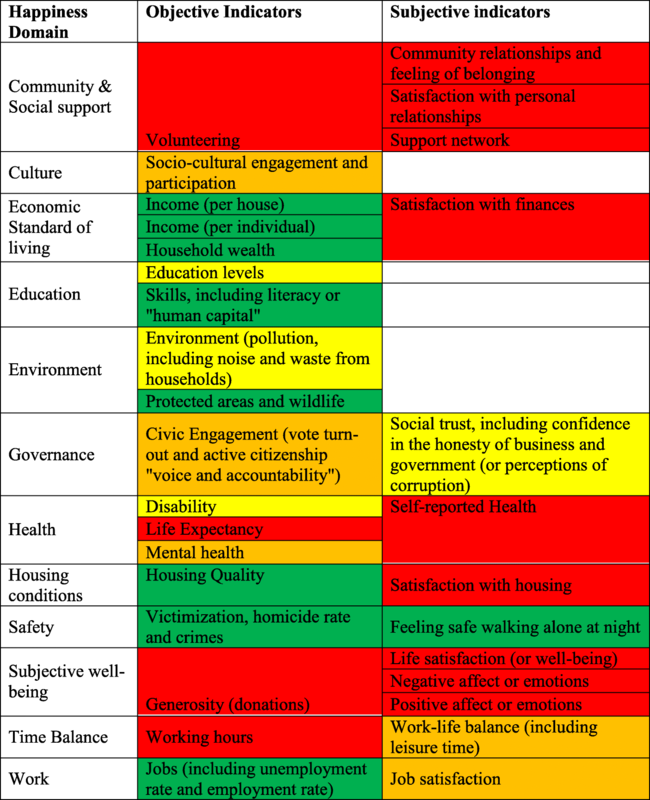 For example, the domain of community vitality for the B-GNH index included indicators that fit into the AHI domains of community & social support as well as safety, and hence was used for both. The WHR was the only index without domains, and hence it was not used to identify domains. The indicators within the five indices used for the AHI were allocated to common domains. When we found composite indicators, we separated them into single indicators. For example, the indicator in the B-GNH index that combines giving time and money was separated into single indicators: one for volunteering time, the other for giving money. The AHI is composed of indicators that occur in at least two different indices. Table 1 presents a schema for identifying qualitative intersections between the AHI indicators and the SDG indicators. The schema is based on a traffic light system that first assess the intersections in colors for a qualitative assessment and then the intersections are converted into a quantitative assessment and assigning a score between zero and three: zero for red, one for orange, two for yellow, and three for green. A Green intersection denotes that the SDG indicators measure the same or very similar concept in the same way (subjective or objective) as the AHI indicators. We call this a covered intersection. For example, a green light is given to the intersection between SDG indicator 1.4.1 access to basic services for householders and the AHI indicator household quality. A color of yellow denotes that the concepts measured by the AHI are partially covered by the SDGs. For example, the AHI indicator for social trust, which includes concepts of trust in business and government and perceptions of corruption, received a qualification of yellow for SDG indicator 16.7.2 which measures people’s sense that governmental decisions are inclusive and responsive to various population demographics. Orange denotes that the concepts within the AHI are poorly covered by the SDGs. For example, the intersection between SDG indicator 3.4.2 mortality rate from suicides and the AHI indicator mental health was considered poorly covered, as while suicide is considered by the World Health Organization (2018) to be caused by mental disorders and inability to deal with life stresses, it is not a direct indicator of mental health in the authors’ judgement. A color of red denotes that the concepts measured by the AHI are not covered within the SDGs. The benchmark is based on a comparison between the AHI domains and indicators and the SDG goals and indicators based on author’s judgements. In some cases, SDGs fit into more than one AHI domain, and so were allocated into more than one domain. For example, SDG Goal 1: No Poverty was fit into the AHI domains of both economic standard of living and housing conditions. When more than three SDG indicators interacted with an AHI indicator, this was stated with an “X”. Only direct intersections between the SDGs and the AHI were considered. When an SDG or indicator may benefit from an increased outcome of other indicators, the collateral impact was not taken into the account, as the extent to which changes in one indicator can impact a goal measured by other indicators is outside the scope of this study. The intersections between AHI domains and indicators and SDG goals and indicators were assigned first a qualitative value (color coded), and then a quantitative value was given in order to assess the aggregated coverage at the domain level. When one AHI indicator was covered by several SDG indicators, the higher coverage rating was considered. For example, if the SDGs included three indicators to measure the same concept or similar concepts measured by an AHI indicator, and one SDG indicator was rated green while the other two rated yellow, a green light was allocated, and a quantitative assessment of three for that SDG indicator was assigned. Quantitative AHI domain coverage for each domain was calculated based on the aggregate mean of all the indicators within each domain. The overall coverage of the AHI by the SDGs was calculated as the mean of all domain coverage. Building an AHI: What Do Happiness Indices Consider? 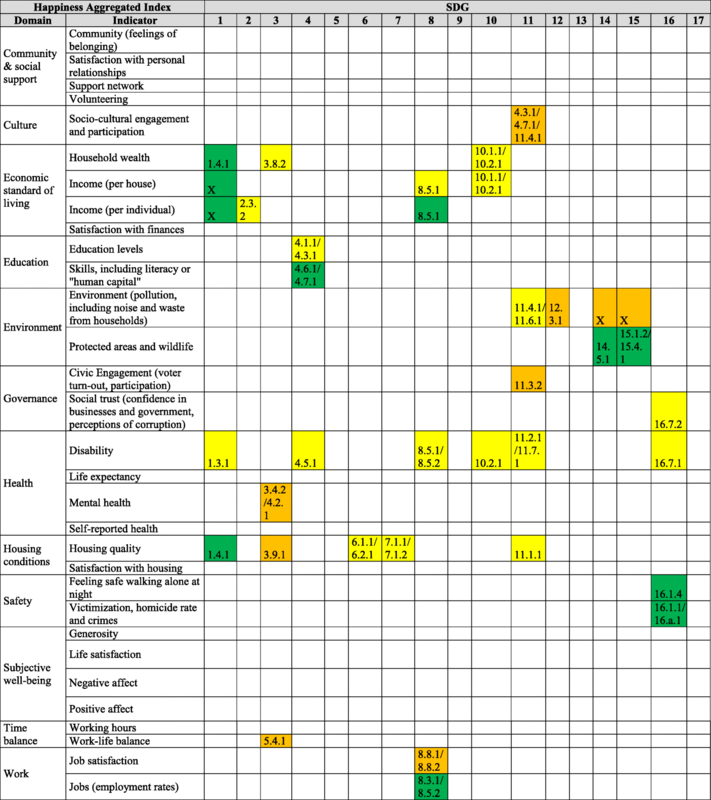 Table 2 presents the 12 happiness domains identified based on the analysis of the four happiness indices that have domains and their original naming in the respective indices. All of the domains identified for the AHI are held in common by the four happiness indices with the exceptions of the domain of culture, which only the B-GNH index and the UK-MNWB index include, and the domain of work, which is not included in B-GNH index but included in the other indices, although the B-GHN index includes an indicator for the creation of jobs by government in the domain of governance. Table 3 summarizes the number of indicators by domain present in each index. The number of indicators for each of the five happiness indices ranged from eight in the WHR to 41 in the UK-MNWB. In general, indices with greater geographical coverage used fewer indicators. With the exception of the WHR where 50% of the eight indicators of the index fall into the SWB dimension, the other indices have a more even distribution of the number of indicators within domains. All the other indices have indicators in all the AHI dimensions with the exceptions of culture that is not considered within the OECD-HLR and the EU-QLI and work for B-GNH that is considered in terms of jobs (see Table 4). The proportion of indicators for the other indices than the WHR within each of the 12 AHI domains varies between 2.94% (for housing conditions and safety in the B-GNH index) and 19.51% (for economic standard of living in the UK-MNWB). An assumption was made that the indicators within the B-GNH index that measure family life and relationships with neighbors fall into the category of community & social support. Making this assumption, every happiness index has an indicator for social support. The compilation of the indicators within the five happiness indices is presented in Table 4. From the five indices analyzed, a total of 71 happiness indicators were identified and 31 were presented in at least two indices so they were considered in the AHI. Community & social support, Economic standard of living, Health and SWB are the AHI domains with the highest number of indicators (four each) while Culture is the only dimension with one indicator. The conceptual framework of the AHI considering when the indicators are subjective or objective is presented in Table 5. All the domains present objective and subjective indicators with the exceptions of Culture, Education, and Environment which only contain objective indicators. In total, the AHI is composed by 58.1% of objective indicators (18 indicators), and 41.9% subjective indicators (13 indicators). Table 6 presents the intersection between the AHI domains and the SDG goals. Fourteen of the SDG goals are categorized into eight of the AHI domains. Three SDG goals do not fit into any AHI domain: (1) Goal 5: Gender Equality, (2) Goal 9: Industry, Innovation and Infrastructure, and (3) Goal 12: Responsible Consumption and Production. Eight AHI domains have a direct association SDG goals, while four do not: (1) Community & social support, (2) Culture, (3) SWB, and (4) Time balance. Table 7 presents a benchmark at the indicator level between the AHI and the SDG using the traffic light schema. In the AHI domains of (1) Community & social support and (2) SWB there are no interactions at the indicator level. However, for the domains of Culture and Time balance, where there are not interactions at the domain level, there are poor interactions at the indicator level. Apart from the indicators within these domains, there are five AHI indicators where interactions are not found: (1) Satisfaction with finances, (2) Life expectancy, (3) Self-reported health, (4) Satisfaction with housing and (5) Working hours. For seven AHI indicators several interactions with different SDG indicators are found. The mean coverage for each AHI domain by SDG at the indicator level is presented in Table 8. The domains of Community & social support and SWB are not covered by the SDGs, while coverage ranges between 16.7% and 100% for the rest of domains. Overall the aggregated coverage of the AHI by the SDG indicators at the indicator level is 48.6%. When looking at the coverage of the objective and subjective indicators SDG indicators cover 61.1% of the AHI objective indicators and 17.9% of the AHI subjective indicators. The SDG indicators measure a broad range of topics with objective indicators. A few topics are measured with subjective indicators such as feeling safe walking alone in the night and proportion of population who believe decision-making is inclusive and responsive. The AHI indicators cover many of the same topics as the SDGs but including objective and subjective measurements. The benefits of using subjective indicators alongside objective indicators has been outlined by various researchers including Diener and Suh (1997) and Boniwell (2017). In 2015, the UN acknowledged the importance of assessing subjective experience and included the concept of well-being into Agenda 2030 (Sustainable Development Solutions Network 2015). However, SWB indicators were not finally included among the SDG indicators. It is beyond the scope of this article to discuss to what extent the achievement of the SDGs will promote happier societies. Given the lack of coverage by the SDGs of relevant aspects of the happiness metrics (see Section 3.2), there are no way to know to what extent progress towards the SDGs will impact people’s happiness using the SDG indicator framework as it stands to date. Including happiness indicators, in particular subjective metrics, into the SDG indicator framework could allow for a means to assess the impact on happiness of progress towards the SDGs. Without integrating happiness metrics into the SDG framework, a paradox could result in which there is a significant progress towards the SDGs and people are not happier or potentially rendered less happy. This kind of paradox where the perceptions are not correlated with objective indicators has been already observed in different contexts. The World Happiness Report ( 2018) for 2018 stated that “Life satisfaction in Latin America is substantially higher than would be predicted based on income, corruption, and other standard variables, including having someone to count on” (p.9). In Indonesia, one of the poorest areas has the highest score for positive affect (World Government Summit 2018, minutes 12:42–13:05). Ensuring a holistic approach to sustainable development. To date, sustainable development is defined in an aspirational way and the linkages to human happiness and well-being are not clear. Incorporating happiness indicators into the SDG indicator framework results in what we term SDGs for happiness. This approach is consistent with the philosophy of Aristotle who believed that happiness is the ultimate purpose of human existence. Aiding policy makers and their efforts to develop inclusive and holistic policies that address multiple needs and priorities synergistically (Diener et al. 2009; Unanue 2017; Durand et al. 2018) at various governance levels through integration of subjective and objective data. Engaging and including people at the individual level as happiness indices have a strong subjective component thereby directly provide people a means to participate through the gathering of data. Thus, happiness indicators used alongside SDG indicators can provide a means for inclusiveness (Nunes et al. 2016). Providing important data to governments, researchers and the private sector that can be used to understand dimensions of populations, establish priorities. and assess the impact of decisions and interventions. Exploring a means to balance competing goals as people’s perceptions are taken into account. Indonesia is integrating the SDGs and happiness frameworks at a national level. In 2018, the Minister Brodjonegoro of National Development Planning of Indonesia spoke about his nation’s efforts at the Global Dialogue for Happiness (World Government Summit 2018). The goal in Indonesia is to “transform SDG into happiness” (World Government Summit 2018, minutes 5:46–5:52). The National Development Planning of Indonesia has developed a happiness index to use in conjunction with SDG indicators already employed by the agency. Indonesia’s happiness index includes indicators for the three domains of satisfaction with life and the conditions of life, affect and flourishing (eudaimonia). It includes indicators for affect including depression, happiness and worry; for satisfaction with life and relationships; and for sense of independence, self-acceptance, and self-development. It also includes indicators for education and skills, employment, environmental conditions, environmental control, family harmony, free time available, health, household income, housing conditions and facilities, and security (World Government Summit 2018, minutes 9:45–11:42). In total, we have identified 18 indicators of which seven are objective and 11 subjective. This set of complementary happiness indicators to the SDGs in order that the SDGs work for happiness offers a means for communities, cities and countries to better understand the conceptual connection between the SDGs and happiness indices. However, our analysis is limited to a theoretical level. In use, the framework would need to be adapted to fit the context and circumstances of the area. Therefore, further research may be needed to develop an overarching set of goals and indicators that guide the integration of happiness measures at different governance levels depending on the contexts and circumstances. This study aimed to better understand the intersections between happiness indices and the SDG framework. As there is not a universal set of happiness metrics, we developed what we called AHI based on five happiness indices. The AHI is composed of 12 domains and 31 indicators. The twelve domains are: (1) Community & social support, (2) Culture, (3) Economic standard of living, (4) Education, (5) Environment, (6) Governance, (7) Health, (8) Housing conditions, (9) Safety, (10) SWB, (11) Time balance, and (12) Work. The AHI was composed of 58.1% objective indicators and 41.9% subjective indicators. The AHI benchmarking against the SDG goals revealed that 66.6% of the AHI domains are covered by the SDG goals. However, the benchmarking at the indicator level showed that 48.6% of the AHI indicators are covered by the SDG. The coverage of the subjective indicators was 17.9% and the objective indicators 61.1%. We provided reasons why happiness measures should be integrated within the SDGs and identified the 18 indicators corresponding to nine happiness domains that could be integrated into the SDG indicator framework to formulate what we call SDGs for Happiness. This is nascent concept and Indonesia is the only country we know that is using happiness indicators in conjunction with the SDGs. The AHI provides a conceptual framework that communities, cities and regions can adapt for their sustainability indicators and fit to their particular circumstances and needs. This study was an effort of El Buen Vivir and Happiness Alliance. Uchida, Y., & Oishi, S. (2016). The happiness of individuals and the collective. Japanese Psychological Research, 58(1), 125–141. https://doi.org/10.1111/jpr.12103. World Happiness Report. (2018). World Happiness Report 2018 http://worldhappiness.report/.